Brief Synopsis: The Super Buddies struggle to defeat Roulette's mind control before they kill one another. 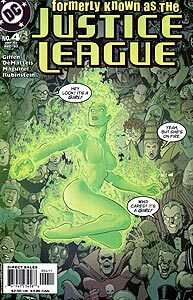 Issue Notes: This mini-series re-unites the characters of the original Justice League International in the hands of the original writers and artists. It was a critical and sales success, spawning a sequel. Events of the Infinite Crisis mini-series have possibly erased some or all of the events in this issue from history. 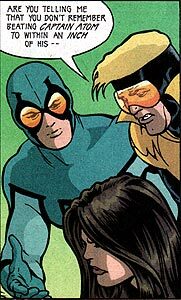 Blue Beetle II and Booster Gold are rescued from Roulette's captivity by Fire, who has subverted Roulette's brainwashing via her bilingual ability. Beetle jokes that Booster thinks in Esperanto, a language designed to encourage inter-ethnic, global communications. Though still spoken over 100 years after its creation, Esperanto has never enjoyed the truly global use that its supporters intend. After Elongated Man uses the word "modicum" (meaning a small amount) which he learned from a comic book, Booster Gold chafes at the mention of comic book writers. Booster's long been irritated by his portrayal in the official Justice League comic books, first speaking out in Justice League America #31. POWER UP: At Beetle's urging, Booster projects his force field some up to 50-yards to defend the unconscious Captain Atom from a fatal beating at the fists of a mind-controlled Mary Marvel. This display is impressive if for no other reason than because Mary has the strength of the Greek Titan Atlas. (Originally, Mary Marvel had the strength of Amazonian Queen Hippolyta, but since the reorganization of the DC Universe following the Crisis on Infinite Earths, her benefactors have been the same as Captain Marvel's.) For several years, Booster's force field has been too weak to ward off the force that Mary Marvel can exert. Beetle, Booster, Elongated Man, and Fire stare skyward at the Cluster. The storefront to their left is Homer's Bakery. It's name and slogan, "Mmmm, Donuts" is a reference to Homer Simpson of the television show The Simpsons. Boosterrific Review: This should be considered the perfect comic book, if only for its fanboy-friendly cover. This is a great comic book, with emphasis on the comic. Very funny with some fine action scenes.